Some of the Golden State’s best fall colors are found in the historic Gold Rush towns of Nevada City and Grass Valley, and along the Yuba-Donner Scenic Byway through Tahoe National Forest in the northern Sierra Nevada mountains. The Nevada City-Grass Valley area, with outstanding Gold Rush history and good choices in lodging and dining, has become known as one of California’s best areas to view autumn foliage. 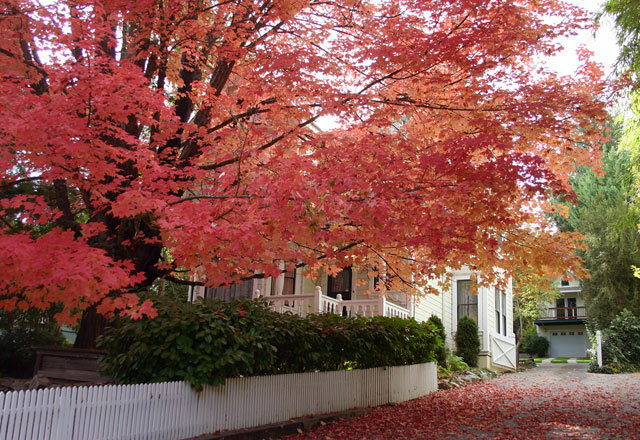 The best fall colors in Nevada City and Grass Valley are located in the old-fashioned Victorian neighborhoods surrounding the downtown historic districts. The most spectacular displays are in century-old Red Maple trees planted by early settlers. Fall weather conditions at 2,500 feet in the Sierra foothills favor formation of brilliant colors in the landscape. As days grow shorter, photosynthesis slows and pigments other than green become more visible. Cool nights prevent the movement of sugar from the leaves, forming a red pigment called anthocyanin. It is often thought that Jack Frost is responsible for the color change, but he really isn’t. Leaves often begin to change before the first frost. Using Grass Valley and Nevada City as a base, motorists can view fall color changes in the forests along the 160-mile Yuba-Donner Scenic Byway, a looped route that follows state highways 49 and 89, U.S. 40, Interstate 80 and state highway 20. The route features a variety of color, ranging from old trees and vines in historic mining villages to the groves of quaking aspens at the higher elevations of Yuba and Donner summits. High elevation colors often begin to change in September and peak in October. Peak color weeks in Nevada City and Grass Valley are difficult to predict but mid-October to mid-November is usually most colorful. Fall color tour maps are available and visitors may call ahead to check day-to-day conditions. Nevada City and Grass Valley are located 60 miles northeast of Sacramento. From the capital, take eastbound Interstate 80 to Auburn and then drive north on Highway 49. From Reno, take westbound I-80 and State Scenic Route 20; a pleasant, 80-mile drive.